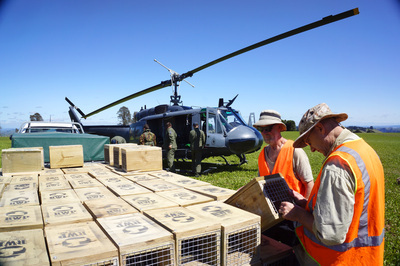 The Whio that live in the Oroua River Valley have been surrounded by traps in an attempt to protect them from the constant threat of stoats and rats. These traps have been placed along the riverbanks and up tracks to the top of the valley's surrounding mountains. The river and lower traps catch most of the rats, but it's the difficult-to-reach mountains where most of the Oroua stoats are caught. 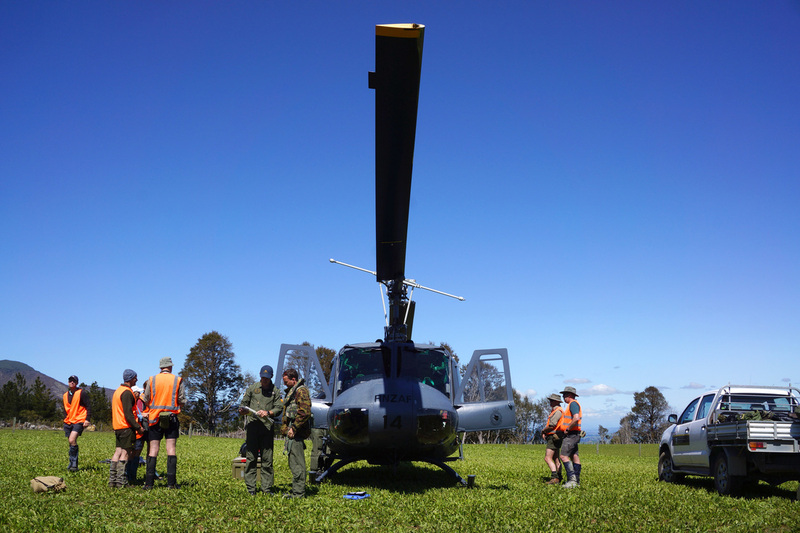 The traps could be carried up the mountain on foot, but they're heavy, so helicopters are used to ferry them around. 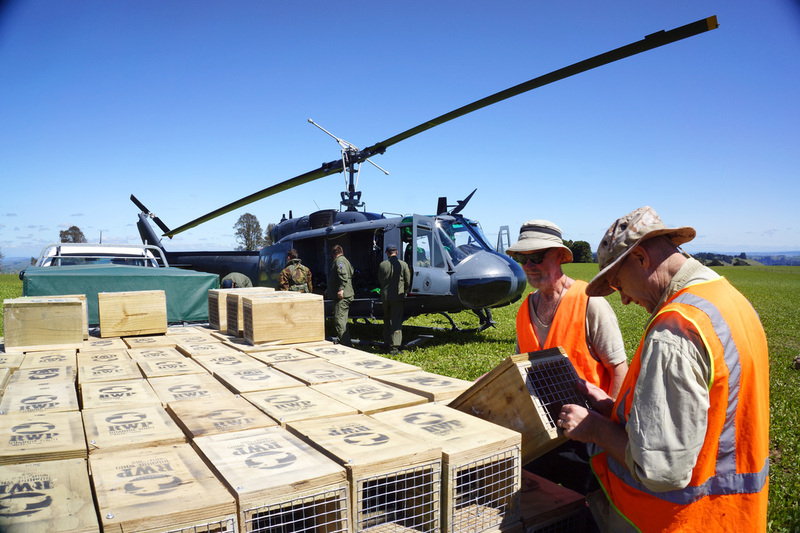 In October, 2014, the Air Force helped deliver 200 new traps to expand the protected area. The Iroquois helicopters were eight months from retirement at the time, so this was probably going to be the last time they work with DoC in the region. Click to enlarge and read captions. It was a privilege to spend the day with DoC and the Air Force and to see a couple of seemingly disparate Government Departments working together. 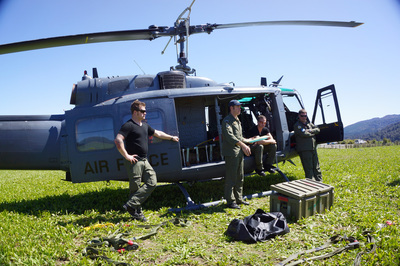 The Air Force were using the day for training purposes and DoC was happy to catch a ride. Long may the relationship continue...I only hope the new helicopters will be this useful and accessible. I'd never flown in a helicopter before, but Apocalypse Now is my favourite movie, so the chance to spend even a few minutes in the legendary Huey was a chance I couldn't pass up. 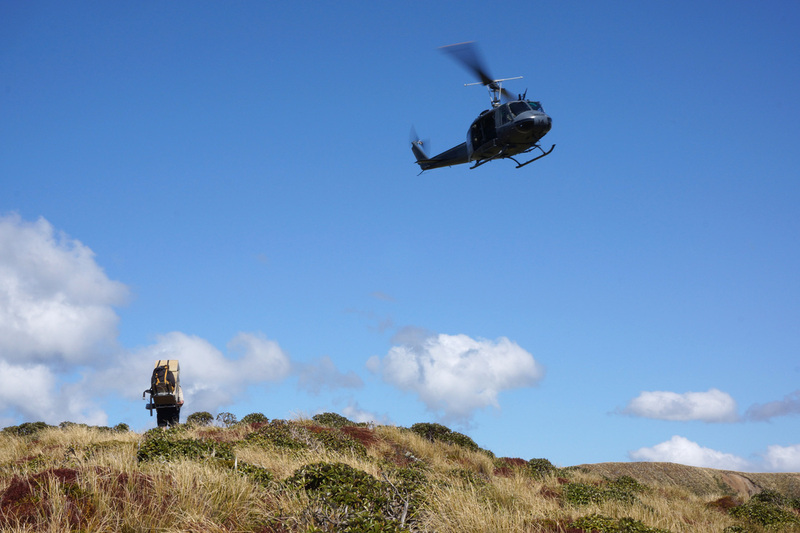 Tramping up to Iron Gate Ridge is usually a two or three day rebait trip for the two of us, but the chopper ride to the ridge lasted less than five minutes. 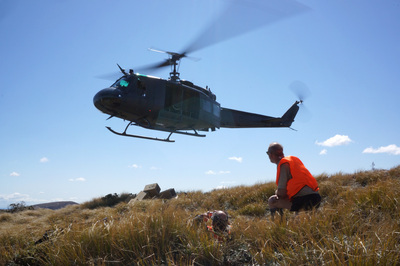 It took about the same amount of time for the trainee pilot to land on the rough tussock. I'm not great with heights so was a bit worried about how I'd take the ride, but there was something about the calmness of the crew that settled me. We even flew with the doors open, a la Vietnam...it was brilliant, short AND sweet.  It was a long day that started with a lot of waiting and ended with a three hour walk out from Mount Tunupo. We arrived home after nine at night. In between our group distributed and baited about 24 traps along the "track" from Iron Gate Ridge at 100 metre intervals. 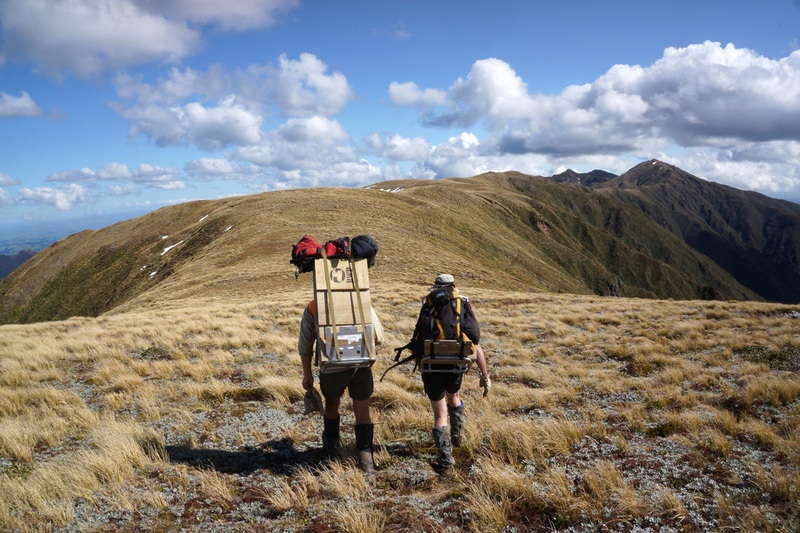 We ran out of traps as the weather closed in and the rise to the Tunupo got steep. The wind and cloud stopped the Air Force from delivering the last couple of loads. The weather over the next two days was worse, so only about half of the traps were put out. The remainder are being placed by foot. It's hard work.